We were not made to do life alone. God created us for community, and Life Groups provide a place for you to connect with others, share life, and grow in faith together. We believe every person is created with God-given potential to make a difference in the world. Life Groups are a place you can grow with others to become more like Jesus and reach the potential God has for you. check out our Life Groups and choose a group that’s right for you! scroll down through the list of groups — categorized by day, type of group, location, etc. Description: Join this evangelistic course geared toward understanding and engaging persons of other faiths and reflection upon the examples of outreach demonstrated in the Gospel accounts of the ministry of Jesus. Description: Are you tired of waiting for harvest time in your life? Are you frustrated, crying out, "When, God, when?" Then we need to understand that God's timing is often not our timing. He doesn't do things on our timetable. Yet His timing is perfect!! Join us as we hear from Dr. Charles Stanley, Francis Chan, Rick Warren and others on what it means to wait for HIS timing for our breakthroughs- whether it is for healing, a new job, a spouse or anything else that you have been waiting for. Description: C25K, is a fantastic program that's been designed to get just about anyone from the couch to running 5 kilometers or 30 minutes in just 9 weeks. Description: It takes courage to walk out our faith. Courage to stand for what we believe. To set our standards on Biblical truth, not cultural trends. To pursue a life defined by integrity and character. And we find no greater profile in courage than in the life of Christ. This study based on Luke 14-24 follows our Savior as he faced opposition, challenged critics, and courageously chose to make the ultimate sacrifice. 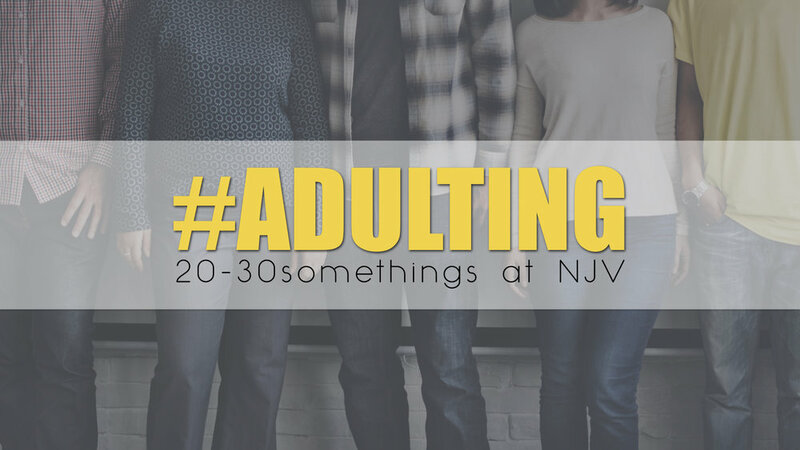 #Adulting is a community of life groups for 20-30 somethings. We meet as a large group for snack and worship at 7 pm. At 7:30 pm we break into small groups for discussion. Sign up for one of the groups below to join us. Description: This is a life group for those that fall in the 18-25 age bracket. Whether you are in college or out of college, married or single, we know there is so much going on during this stage of life, and it doesn’t seem to slow down. That’s why staying in community is key. Description: Join us in fellowship as we craft and build friendships with one another. Whether you are new to crafting, wish to brush up, or are a seasoned crafter -- all are welcome! Throughout the semester we will have tutorials on sewing, crocheting, knitting, jewelry making, painting, etc. Supplies are provided through generous donations to our group... so all you have to do is show up and start crafting! The projects you make can be for yourself, a friend/relative, a donation to one of our outreaches, or a donation to our craft fair that benefits the Judah Quay Orphanage in Bolivia. Description: Are you in control of your life? Do people take advantage of you? Do you have trouble saying no? Christians often focus so much on being loving and giving that they forget their own limitations. Have you ever found yourself wondering: *Can I set limits and still be a loving person? *What are my legitimate boundaries? *Why do I feel guilty setting boundaries?” Drs. Henry Cloud and John Townsend give you biblically based answers to these and other tough questions, showing you how to set healthy boundaries with parents, spouses, children, friends, coworkers, and even with yourself. Description: With the completion of the Gospel of John last semester we will continue by studying John’s three letters to the church. Then, we will turn to the letter of James. The opportunity to share and to receive prayer will be available. Description: Find help and healing for the hurt of separation and divorce in this caring group that will walk alongside you through one of life’s most difficult experiences. Whether your situation is recent or years ago, don’t go through separation or divorce alone. Do not lose hope — our Heavenly Father will never fail you or forsake you. Description: We will be exploring different ideas about the importance of worship as part of our daily expression of faith and how it affects our growth in Christ. We will be learning from various streams that are influencing the way the contemporary church does worship services, comparing it to scripture and our values as a Vineyard church. This is for all who are interested in learning more about why we worship in church the way we do and how that becomes a part of our daily experience with God. Description: Wouldn't you love to be wise and know the God who is Wisdom Himself? This 10-week study of Job, Psalms, Proverbs, Ecclesiastes, and the Song of Solomon mines the Wisdom Literature not only for wise principles for living, but also for the wise person these books point to — Jesus. Description: This group is designed to equip you to live the victorious and abundant life Christ came to give you. Join us as we build on the foundation of your faith in Christ to help you embrace the truth of God’s Word as it relates to your worldview, your past, your sin, your personal value to God, and your purpose in His Kingdom. This group will help you remove every obstacle to intimacy with God and walk in true freedom. Description: Nancy DeMoss Wolgemuth comunica este mensaje liberador a una nueva generación. Mentiras que las mujeres creen presenta cuarenta y cinco mentiras que las mujeres cristianas creen con mayor frecuencia; mentiras acerca de Dios, ellas mismas, las prioridades, las emociones, el matrimonio y la maternidad, entre otras. El libro ofrece el único medio para confrontar, contrarrestar y vencer el engaño: la verdad de Dios. Description: We will be gathering together for comfort food, warm and loving fellowship, worship, and prayer during our study of the Psalms. De Moss encourages us to draw closer to our Heavenly Father, exploring fresh and new glimpses of God's love for us expressed through the Psalms. It will be interesting to see what new insights we can glean from this exciting book. Description: Often the biggest obstacle to living out our faith is our own doubt--about our worth, our abilities, our relationship with God, and situations in our lives. A Confident Heart gives voice to the questions, doubts, struggles, and hopes so many women have. Author Renee Swope shows us how to identify, overcome, and learn from our self-doubts so that we can live confidently in God's assurance, truth, and grace. Description: Join this wonderful group of volunteers who come each Thursday to prep for our weekend services! Spend time volunteering together as part of Team Vineyard, then enjoy a time of pizza lunch, a weekly Psalm, and prayer for each other. Description: Join us as we explore God’s freedom from strongholds in your life. Whether it’s from the things that that keep from being who God created you to be, or issues such as depression, addiction, bad habits, etc. — discover the transforming power of Jesus in your life. Description: We seek to draw near to God together as we encourage one another through studying the Word of God, sharing our lives, and lifting each other in prayer and worship. We study the basics of a Christian faith applied to everyday lives at home, workplace, school, etc. Our goal is to become and feel closer to God as we let the Holy Spirit work in our lives. About this book: Stop and realize how God uniquely designed you for a purpose only you can fill. Before you were born, God already planned your life. God longs for you to discover the life he created you to live — her eon earth, and forever in eternity. Let The Purpose Driven Life show you how. Description: ¡Cuando realmente crees en la Biblia, entonces te lleva a la acción! El creer no es un sentimiento pasivo. Creer es mucho más que el reconocimiento intelectual de lo que está escrito es verdad. Creer, también es más que tener la confianza que la Biblia es inspirada por Dios. Realmente creer, significa tener fe en que Dios vive, que es activo y está muy interesado en mí hoy. Description: In Doing Healing Alexander Venter gives us an awesome vision of God’s healing power by addressing incisively and provocatively the questions of how we understand sickness and healing, how our view of reality affects this understanding, what the Bible says about it, how Jesus healed people, and how he authorized and empowered the church to heal. Description: Romans, the letter that changed the world. Paul's letter to the early churches in Rome revealed the both transforming light of the gospel and the darkness of the surrounding world. Come join us for a deep dive into Romans. Let's develop a greater understanding of God's love and deepen our faith and trust in him. Description: Emotional health and spiritual maturity are inseparable. It is not possible to be spiritually mature while remaining emotionally immature. We will use Emotionally Healthy Skills 2.0 (DVD & workbook) to provide the needed practical skills for your spiritual formation journey in order for you to grow into an emotionally healthy follower of Jesus. Each session is designed to teach you new skills that enable you to put Scripture into practice — integrating them into your relationships at home, work, neighborhood, and church to transform both you and those around you. Description: We believe in creating and fostering God centered relationships between men. We look forward to seeing you. About this book: Discover a richer spiritual life infused with joy, peace, and a deeper understanding of God. Celebration of Discipline explores the “classic Disciplines,” or central spiritual practices, of the Christian faith — showing along the way that it is only by and through these practices that the true path to spiritual growth can be found.